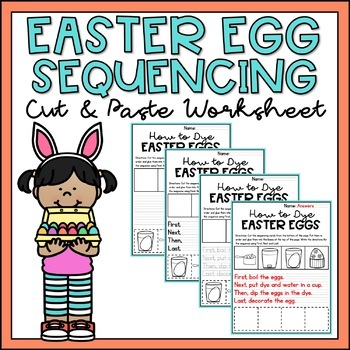 These Easter sequencing worksheets have students sequence 4 pictures and then write a sentence about each using First, Next, Then and Last. This pack includes 4 pages containing 3 leveled worksheets and an answer page. LEVEL1: This level is for students who are up to grade level and do not need additional support sequencing or writing using First, Next, Then and Last. Students will cut out the timeline pictures, paste them in the correct order and then write a sentence for each sequence using First, Next, Then and Last. LEVEL 2: This level is for students who only need support with using the First, Next, Then and Last in their writing. Everything else is the same as level 1. LEVEL 3: This level is for students who need the most support. It has pre-written sentences that students trace. This helps those who have trouble putting events into a sequence on their own or forming proper sentences. Click the PREVIEW button to see an example of each level from a similar sequencing resource. Feedback helps other teachers find great resources for their classroom AND rewards you with credit to use on future TPT purchases! You can leave feedback for purchased and free products from your "My Purchases" page. Follow me to get 50% off new resources! Click the green star under my logo (on the right side of this page) to grab my new resources half off for the first 48 hours! All products (excluding bundles) are discounted.